HOME>books>The SUEZ MARU Atrocity - Justice Denied! 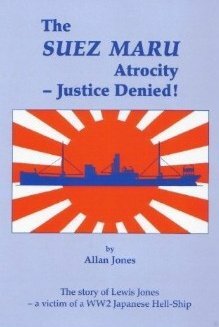 The SUEZ MARU Atrocity - Justice Denied! Although this is a very personal story and although it relates to events that occurred more thanfifty years ago, its message is as relevant today as it ever was.The close of hostilities at the end of the Second World War did not bring about the end of international conflict, despite all the hopes that it would. Nor, regrettably, did it mark the end of acts of gross inhumanity against military personnel or civilians caught up in combat, as events in Vietnam, Afghanistan,Rwanda, the former Yugoslavia and elsewhere have revealed. The question is, can such atrocities ever be prevented if there is not an absolute commitment to prosecute all cases of breach of international agreements, no matter who the perpetrators are? This is the story of a British soldier, a decent and unassuming man who, through unfortunate circumstances of fate, became a victim of a callous and unforgivable war crime along with 547 of his comrades. Despite the nature of this appalling crime and the most blatant act of deception that was intended to conceal it, those responsible were never brought to trial. It could be argued that the lack of resolve that allowed the guilty to go unpunished in this and other cases like it has encouraged certain despotic regimes to revert to acts of extreme inhumanity - ethnic cleansing as it is now known - in the years since, seemingly in the full confidence that they can get away with it. While readers will be able to relate to the failure of the war crimes prosecution system to exact justice for Lewis Jones and the other victims of the Suez Maru, they will also be able to identify with the pain and anguish that war can inflict upon an ordinary, decent man, who had all his life ahead of him, as well as on the wife he left behind. The author, Allan Jones, the only son of Lewis Jones and now retired after 36 years with British Telecom, was himself called up in 1958 to do National Service during which he served as a Sergeant with the Royal Army Ordnance Corps. Married to Vivienne, he has two grown-up Children , Lindsey and Paul. Allan is a member of COFEPOW. Allan has kindly offered to donate £2.00 to COFEPOW funds for each copy of the book sold to a COFEPOW member. We would therefore ask that members contacting Allan, to purchase a book, make their membership known to him. Thank you.